Posted by phillijb on Thursday, September 13, 2018 in News and Events. The Studio VU Lecture Series and the Department of Art at Vanderbilt, in collaboration with the Memorizing the Future: Collecting in the 21st Century Conference and co-sponsored with the Jean & Alexander Heard Libraries, present acclaimed artist, John Gerrard on October 4, 2018 with a lecture beginning at 6:00pm in the Central Library Community Room on the Vanderbilt campus. 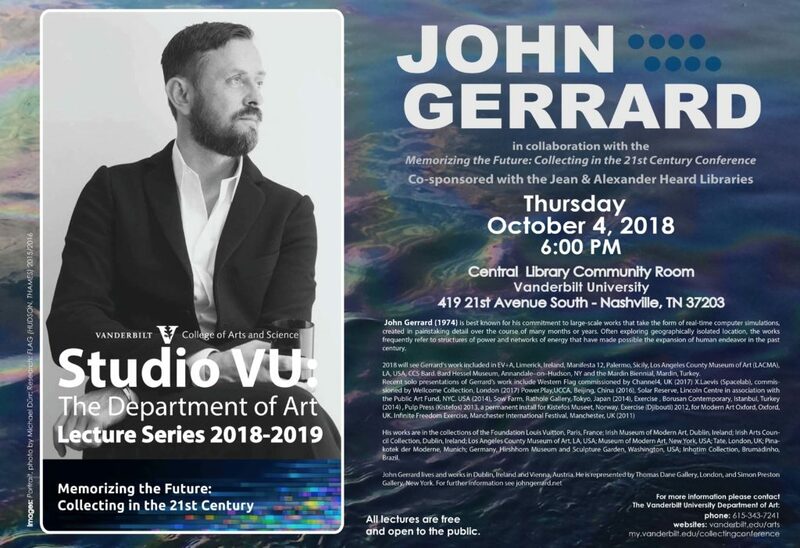 The lecture will be followed by a discussion/interview moderated by Lutz Koepnick, Gertrude Conaway Vanderbilt Professor of German, Cinema and Media Arts; Chair, Department of German, Russian and East European Studies. 2018 will see Gerrard’s work included in EV+A, Limerick, Ireland, Manifesta 12, Palermo, Sicily, Los Angeles County Museum of Art (LACMA), LA, USA, CCS Bard. Bard Hessel Museum, Annandale–on–Hudson, NY and the Mardin Biennial, Mardin, Turkey. His works are in the collections of the Foundation Louis Vuitton, Paris, France; Irish Museum of Modern Art, Dublin, Ireland; Irish Arts Council Collection, Dublin, Ireland; Los Angeles County Museum of Art, LA, USA; Museum of Modern Art, New York, USA; Tate, London, UK; Pinakotek der Moderne, Munich; Germany, Hirshhorn Museum and Sculpture Garden, Washington, USA; Inhotim Collection, Brumadinho, Brazil.